Around this time last year, I was asked to help some colleagues who were contributing to a book by IBM VP Maria Azua about innovation and collaboration in the workplace. In particular I spent some time reviewing a chapter by Laurisa Rodriguez, who I’d been working with for several years and had met up with along with many of the other contributors at the Web 2.0 Expo in Berlin a month or so earlier. I was aware that the book was due to be published during 2009 but I’d been so busy with the day job that it had dropped off my radar. Then I noticed a couple of incoming links from others who were writing about it (and found Laurisa’s blog post about it)… and realised that it had hit the shelves. 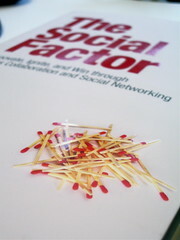 The book, The Social Factor (Amazon link), is published by IBM Press and features contributions from many of the IBMers I’ve come to know through our internal social networks and tools over the past five years. It contains perspectives which reflect many of our experiences adopting tools and techniques such as tagging, blogging, wikis and social bookmarking inside the enterprise. It also discusses something I’ve frequently referred to in my speaking engagements – IBM’s highly successful Technology Adoption Program (TAP), which Maria herself established, and which continues to drive a lot of innovations inside the organisation that feed out into software products and service offerings. There’s a good Redbook about TAP available, of course, but it’s worth reading more in chapter 10 of this book. It’s always nice to see one’s name in print… despite being a blogger I’m not sure I’ve got an entire book to write, so this may be as much as I get… so for those interested, you’ll find a small quotation from Laurisa’s interview with me – about Twitter, of all things, imagine that! 🙂 – on page 105. So, if you’re interested in the impact of social media, crowdsourcing and technology on innovation in a large enterprise, check out The Social Factor. I may be biased because I’m mentioned and several of my friends contributed to it, but I purchased my own copy, I’m making nothing from the book myself, and I believe that it is a great read! This entry was posted in 24924, blog and tagged book, collaboration, IBM, innovation, Social networking, technology adoption program, the social factor. Bookmark the permalink. Nice post. I look forward to learn new insights from you gained fm this book . Btw, Andy, i look forward to see a book authored by you. It would be really a proud thing to do. Keep it as a goal for next year. If you wish, I can contribute to a chapter in it though 😉 and keep you motivated throughout until you finish writing. I’m with Ruchi on this Andy! Hi Andy! Nice blog post about The Social Factor. I had a great time researching and writing my contribution, which of course included chatting with you. This was a book that was created in a large part through social collaboration. I used all external and internal forums available to research and sum up how these tools can be useful in today’s business world.